An employee filing a claim of unlawful retaliation must establish three separate elements. Protected Activity. There are two general categories of protected activity. The first, participation, refers specifically to raising a claim, testifying, assisting or participating in any manner in an investigation, proceeding or hearing under an EEO law. Participation activities are broadly protected. For example, unlawful participation retaliation may occur even if the underlying allegation is not meritorious or was not timely filed. The second category, opposition, refers to acts taken in opposition to an unlawful EEO practice. Opposition activity broadly includes the many ways one can explicitly or implicitly communicate opposition to perceived employment discrimination. The manner of opposition must be reasonable and must be based on a reasonable good faith belief that the conduct being opposed is, or could become, unlawful. any other type of adverse treatment that in the circumstances might dissuade a reasonable person from engaging in protected activity. Causal Connection. To be considered unlawful retaliation there must be a causal connection between a materially adverse action and the protected activity. Depending on the facts and nature of a case, an employee may be required to show that but for a retaliatory motive, the employer would not have taken the adverse action, or that retaliation was a motivating factor in the materially adverse action. This is typically the most contentious part of a retaliation case. any other pieces of evidence which, when viewed together, may permit an inference of retaliatory intent. It’s important to note that employees cannot immunize themselves from the consequences of poor performance or improper behavior by engaging in some form of protected activity. Employers are free to discipline or terminate employees for legitimate, non-discriminatory and non-retaliatory reasons, notwithstanding any prior protected activity. Nevertheless, employers must proceed cautiously when dealing with employees engaging in protected activities. For example, if a manager recommends firing an employee who contacted the EEOC about discrimination, the employer should independently evaluate whether the adverse action is appropriate. Otherwise, an employer may be exposed to potentially substantial compensatory and punitive damages. 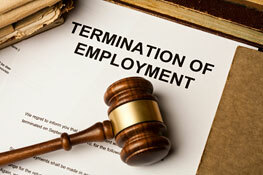 According to the EEOC, training employees is an effective way to reduce the likelihood of unlawful retaliation. Please contact us if you would like more information about implementing an employee training program. How Can Employers Avoid the EEOC in 2017?